Smart-Packs are the Smart Choice! around in a very long time!" Empty Smart-Pack once for every 8-10 times conventional trash bins are emptied. The Smart-Pack will not overflow! Eliminate leaks & overflows around trash bins! Smart-Pack trash compactors save waste hauling, labor, trash liners, etc.! 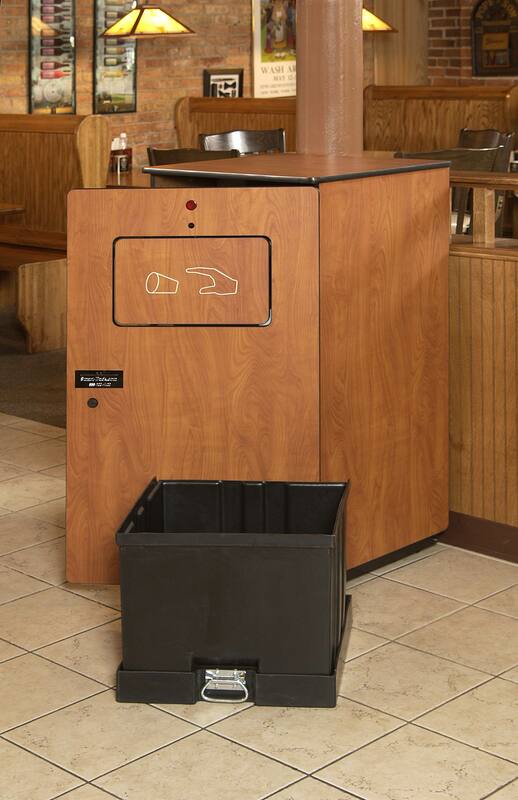 The Smart-Pack is a commercial trash receptacle which automatically compacts trash based on customer traffic flow. Compact trash directly at the source, right where it is disposed of... in your dining or other public use area! It just makes sense! The fully-automatic Smart-Pack, Automatic trash compactor can be used anywhere patrons dispose of their own trash in public areas. The Smart-Pack can also play messages to your patrons. Offering a very quick payback through savings in labor, waste hauling and trash liners, the Smart-Pack is a necessity for quick-service restaurants, malls, airports, schools and colleges, etc! The Smart-Pack is constructed of the HIGHEST-QUALITY materials offering RELIABLE, TROUBLE-FREE Operation 30 Years of Compactor Manufacturing Experience behind the Smart-Pack. It Talks! ... Advertise desserts & specials on your Smart-Pack! Children will keep your place clean because they enjoy throwing away trash in the Smart-Pack! "Now we're wondering how we ever got along without them (Smart-Packs). A lot of costs, inefficiency and headaches have been eliminated. Our customers even love them... No matter how old they are, people are amazed by the talking feature. And, they (Smart-Packs) make the dining area look so much cleaner." -- Management, Quick-Service Restaurant Operation. "This (Smart-Packs) is one of the best paybacks we have ever achieved on equipment ... very impressive!" "It (Smart-Packs) keeps it looking clean." "I think they (QSR restaurant) should use them in all their stores... they're (Smart-Packs) so clean." the number of trips for the trash truck." "I think the best feature is that it doesn't smell and that it talks." "I think keeping the customer number one makes you (the restaurant) number one. Keep up the good work." "I like it... it is very nice!" "It's really nice and you don't have to touch the trash door which carries a lot of germs." Usually Smart-Packs become full no more than 1 time per day, therefore they can be emptied on a scheduled basis during daylight and off-peak hours. Time consuming trips to the dumpster can be dramatically reduced when waste is compacted where it is generated. This not only reduces labor requirements for waste processing, but also greatly improves overall labor productivity since daily 'work routines' can become more refined. With typical trash profile, the equivalent capacity of up to 10 or more of the 25-gallon (regular) trash receptacles can be deposited in each Smart-Pack before being emptied. Employees can use this saved time tending to customers rather than trash duties. A reduction in trips to the dumpster by employees can help reduce the risk of pilferage, robberies, excessive breaks and unattended customers. Since Smart-Packs help address leakage problems associated with regular bins, the risk of 'Slips and Falls' can be reduced. Fire hazards, due to temporary trash storage (while awaiting dumpster trips) can also be reduced. Containerized, compacted waste is cleaner, safer and neater. Unsanitary trash spills and overflows are reduced or eliminated inside the establishment and around dumpsters. Customers no longer have to experience the horrible sights and smells that are common with regular bins (especially when emptied). In addition, keeping trash compacted and contained reduces vermin and rodents around dumpsters and inside the establishment. A cleaner, fresher dining environment invites more customers. Loose, non-compacted trash can occupy up to 20 - 25 times more dumpster space than compacted waste. Waste hauling costs can oftentimes be reduced by as much as 50% or more, due to a decrease in dumpster tips & fewer and/or smaller dumpsters. When used properly each Smart-Pack has the potential to reduce trash related labor requirements by as much as 1 - 2 hours per day per Smart-Pack. General labor and lack of productivity attributable to trash related duties and associated tasks (such as constant demands of overflowing trash bins and mopping up leakage from the dining area floors) can be replaced with much more productive uses of time (such as tending to customers and revenue producing activities). For example, a regular trash bin that has to be emptied or tended to after approximately every 40 - 50 customers' (waste deposits) would translate into an average of about 400 - 750 customers before the Smart-Pack reaches "full" capacity or needs to be tended to. And this does not include the extra employee attention that is normally required for regular trash bins as a result of 'leaks and spills' and trash bin overflows. When utilized and cared for properly, each Smart-Pack has the potential to produce direct labor productivity benefits that can be significant. Replace the use of approximately 10 - 15 liners with only one heavy duty bag used with the Smart-Packs (and this is assuming that the regular bins are only single-lined). Substantial savings can be realized. Considering labor productivity benefits and and waste hauling savings alone, paybacks can be less than 2 years (not to mention tax benefits, depreciation and other savings and benefits). By leasing, immediate savings may be realized in the very first month. Under normal conditions, the Smart-Pack should last many years longer than traditional trash bins. With the Smart-Pack Sanitizer System, Smart-Packs in lower traffic locations can continue to accept trash for up to 1 week without having to be emptied, free of odor concerns. In addition to allowing lower volume locations the opportunity to achieve excellent paybacks in the same manner as high volume locations, this feature also addresses odor and sanitation concerns that are normal with trash bin areas in general (even when the regular bins are constantly being changed). The weight / volume of the compacted trash (when the unit signals "full") can be adjusted by user controls. With the Programming System, Smart-Packs can easily broadcast messages of your choice to customers. Simply download existing or custom-made sound files into the Smart-Pack. This is a great source of advertising and entertainment. The Smart-Packs allow more opportunities and flexibility with marketing programs that would otherwise generate too much trash to handle. Even under unusual circumstances such as power outages, Smart-Packs can be adapted so that they are always available for your patrons waste deposits. For more information on the Smart-Pack, complete an Information Request form on this Website.